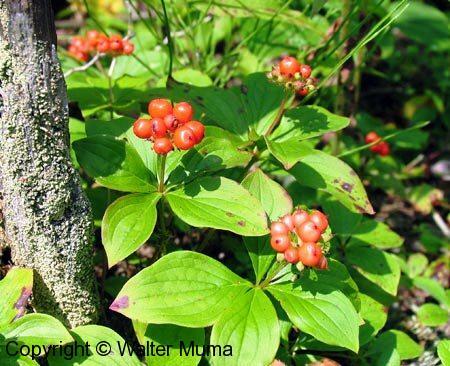 Distinctive features: Sub-Shrub; Very low plants, typical dogwood leaves, bright white flowers, red berries. Flowers: Summer; White; 4 parts (petals); White, tiny cluster, surrounded by white petal-like bracts. Leaves: Opposite/Whorled, Simple, Entire; Whorled on one tier. Occasionally on two tiers. Typical Dogwood style leaves. Trunk: Stem very short - this is a "subshrub". Habitat: Forests; Common in woods everywhere. Also in bogs. Edible: The berries are edible, but hardly worth it due to the single hard seed at the center to which the edible part clings tenaciously. Photographs: 118 photographs available, of which 9 are featured on this page. SCROLL DOWN FOR PHOTOGRAPHS. 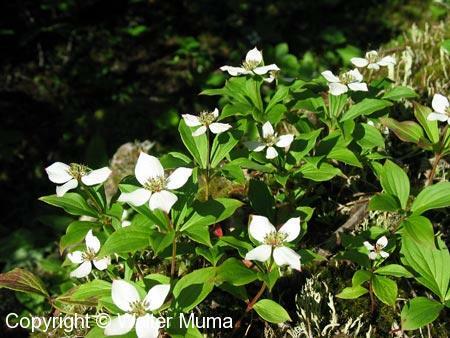 A "grove" of Bunchberry in the forest, in bloom. Closer view of some flowers. Flowers done, fruits forming. The white "petals" are actually bracts surrounding a cluster of tiny individual flowers. Ripe fruits in July. These berries are edible. However, they are hardly worth the effort, as they contain a very large and very hard single seed. The fruit pulp sticks tenaciously to this seed, and it's very difficult to separate. 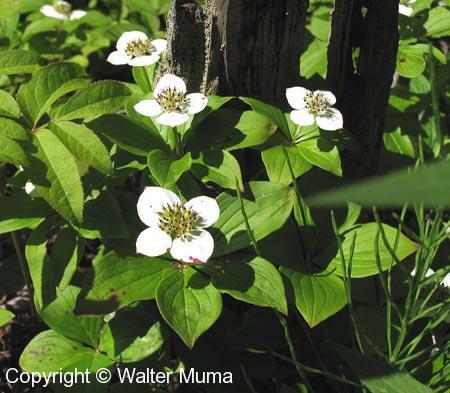 Bunchberry make a great ground cover, if you are into native plant gardening and naturalizing your property.